Nick Janiga and David Walline of HealthCare Appraisers, Inc. (HAI) examine how the Affordable Care Act (ACA) affects the valuation of physician-owned hospitals and what the future holds for the 240 such medical institutions across the country. It is important to note that the limitations on physician-owned hospitals discussed above are not applicable to physician-owned hospitals that do not accept government payors (e.g., Medicare, Medicaid, Champa, and TRICARE). In fact, there are a number of physician-owned hospitals currently under development as they will not be accepting government payors. Given the changing payor landscape under PPACA, these physician-owned hospitals could be accepting a smaller–than-expected percentage of total patients within a market. Recently, within the Medicaid Payment Advisory Commission (“MedPAC”) Report to Congress, MedPAC suggested a “site-neutral payment” cost-cutting recommendation, which, if implemented, would cut payments to hospitals for services that can be provided at a lower cost in a physician office or ambulatory surgery center. Subsequent to MedPAC’s initial statement, Congress’ board of Medicare experts released a report offering 66 other ambulatory payment areas where a “site-neutral” policy could be used to derive $900 million in additional annual savings (in addition to the $1.0 billion estimated savings from the initial MedPAC cost-cutting suggestions). It is estimated that the total site-neutral changes would cost hospitals over $2 billion annually and increase hospitals’ Medicare outpatient losses from 11 percent to 17 percent.4 This reimbursement risk is particularly relevant to physician-owned hospitals as the 66 ambulatory payment areas under consideration focus primarily on basic, low-acuity, and elective surgeries, which tend to be outpatient. Due to the regulatory environment, the permissible avenues for expansion for physician-owned hospitals are complicated.5 The three primary avenues of expansion for a physician-owned hospital include: 1) physician syndication; 2) increased operational efficiency; and 3) corporate partners. These three avenues are discussed in the following sections of this article. Many physician-owned hospitals originally focused on orthopedic and spine surgery. As these hospitals have matured, many have syndicated6 to physicians focusing on other specialties such as neurology, pain management, ophthalmology, otolaryngology, general surgery, gastroenterology, etc. Though the aggregate physician ownership percentage must remain unchanged, diversifying physician specialties creates new avenues for revenue and profit growth, particularly for physician-owned hospitals that have operating room and bed capacity. Anticipated volumes should not be specifically factored into the buy-in price for new investors, but,over time, the diversification may lead to higher revenue growth, reimbursement stability, and profitability, all of which will impact valuation multiples. 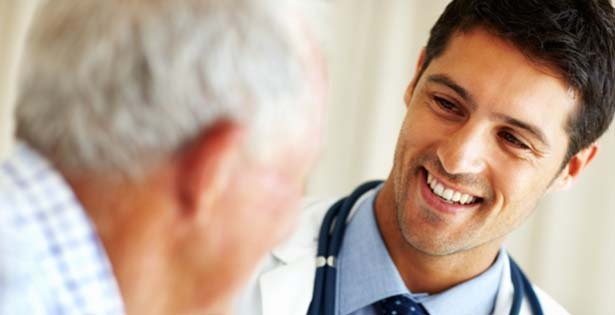 Whether done for the purpose of syndication or looking at the value of the hospital as a whole, it is important for the executive team of the subject physician-owned hospital to work closely with the appraiser to understand how potential syndication could impact projected revenue and profitability. Outside of syndication, there are a number of operational strategies that can be implemented to allow for continued growth. Increased efficiency and turnover of operating rooms through the use of additional staff, increased surgery hours and weekend surgery hours, block scheduling of surgeries based on acuity, and other time-based strategies can be implemented or improved upon. A key benefit to these strategies is very low, if any, additional fixed expenses while providing a high likelihood of greater revenue growth and overall profitability after implementation. In addition to time-based strategies, physician-owned hospitals can add to existing ancillary service lines. In HAI’s experience, most physician-owned hospitals already have diagnostic imaging and laboratory services; however, HAI has observed physician-owned hospitals expanding to offer outpatient therapy services to the extent there are not physical space constraints. Adding additional ancillary service lines can not only increase patient satisfaction through additional quality care, but also enhance the earnings potential of the physician-owned hospital. All of these strategies have the impact of increasing operating room turns, quality of patient care, and overall operational efficiency of a physician-owned hospital. As a result, a physician-owned hospital implementing any one of these strategies appropriately can realize increased return on assets and ultimately a higher concluded valuation multiple. Many physician-owned hospitals would not have opened their doors and received certification prior to the December 31, 2010 cutoff date without the involvement of management companies. Management companies provided crucial insight during the planning and development stages of physician-owned hospitals as well as contracting, billing, collection, and other operational services until physician-owned hospitals gained traction in their respective markets. In exchange for these services, management companies typically received a management agreement for ongoing services as well as a minority ownership interest in the physician-owned hospital. These minority interests usually came with voting and other ownership rights superior to the ownership rights of the minority physician investors. The advantage of an ownership unit that possesses greater voting and ownership rights is lower secondary discounts, such as discounts for lack of control and marketability, resulting in a greater value per ownership unit for the management company. The additional value associated with the management company’s ownership places some incentive on the management company to sell its interest once its services are no longer needed. This typically becomes a factor once a physician-owned hospital reaches a mature operating position and has the infrastructure to bring the contracting, billing, and accounting services provided by the management company in-house. However, due to PPACA, physician-owned hospitals cannot re-syndicate the management company’s minority ownership interest to additional physicians or retire the management company’s interest and, as such, alternative buyers must be considered. Based on HAI’s observations in the physician-owned hospital market, other buyers for the management company interest may include general acute-care hospitals, healthcare insurance companies, and other private investors. If bringing in another entity as a partner is not desirable, it is also an option to re-syndicate a portion of the management company’s interest to the existing executive team at the physician-owned hospital. This option is an excellent way to better align the interests of the executive team with the overall success of the physician-owned hospital. Given the continued healthcare reform that is taking place and the continued push towards the development of accountable care organizations, physician-owned hospitals may be interested in aligning with organizations that have made meaningful progress in the development of accountable care organizations. The professional practices of the physician-owners could also align with a particular general acute-care hospital. The alignment of the professional practice(s) could dictate the selected corporate partner of the physician-owned hospital. Depending on the selected corporate partner, there could be the opportunity for assistance with negotiating commercial payor, medical supply, durable medical equipment, and other contracts. Should a management services agreement terminate due to the sale of the management company’s minority interest, there is typically a pickup in profitability assuming the cost to replicate the accounting, contracting, and billing services are less than 2 percent to 6 percent of net revenue (i.e., the management fee). All of these items lead to increased profitability and ultimately increased value of the physician-owned hospital. As an alternative to directly expanding ancillary offerings as previously outlined, physician-owned hospitals can also set-up partnerships with skilled nursing facilities or home health agencies to expand their procedure offerings, achieve better bed days, and provide a better recovery program for patients. This strategy is especially beneficial if a physician-owned hospital is having bed capacity issues, treats patients with relatively more acute cases, and wants to maintain a quality patient recovery program. Additionally, more complex cases can be performed at the physician-owned hospital because the patients can be monitored for a longer time period at a nursing facility after the procedure is completed. In HAI’s experience, the majority of physician-owned hospitals are income-producing, going-concern entities. As such, the two primary valuation approaches used when valuing physician-owned hospitals are the Income and Market Approaches. Under both approaches, HAI is focusing on the subject hospital’s projected free cash flow7 and the risk inherent in the subject hospital achieving the free cash flow projections. This risk is factored into the Income Approach in the form of a discount rate and into the Market Approach in the form of a valuation multiple (a valuation multiple is simply the inverse of a discount rate). Under the Income Approach, HAI is relying on the Discounted Cash Flow Method (“DCF Method”) when valuing a physician-owned hospital. The DCF Method, in its simplistic form, requires the valuator to project future free cash flow and discount those cash flows back to present-day using a risk-adjusted discount rate. Under the DCF Method, higher free cash flows and a lower discount rate result in a higher concluded value (and vice versa). As indicated in the body of this article, there are a number of ways to increase cash flow and/or reduce the riskiness of the operations of a physician-owned hospital. Under the Market Approach, HAI utilizes the Guideline Public Company Method (“GPCM”) and the Comparable Transaction Method (“CTM”), although the use of either method is almost always used as a sanity check for the Income Approach conclusion. The GPCM is difficult to rely upon given the obvious differences between publicly traded health systems and physician-owned hospitals. Publicly traded health systems have a greater geographic reach, are much larger, provide a larger scope of services, and have a vastly different risk profile. 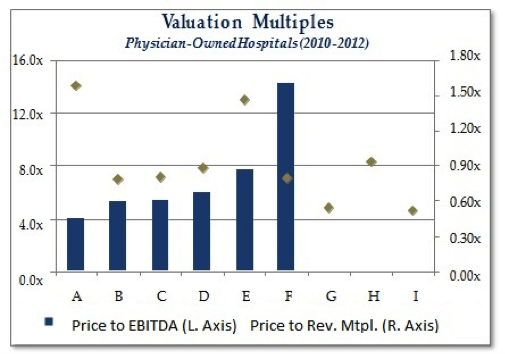 All of these factors make public company valuation multiples difficult to rely on when valuing a physician-owned hospital. 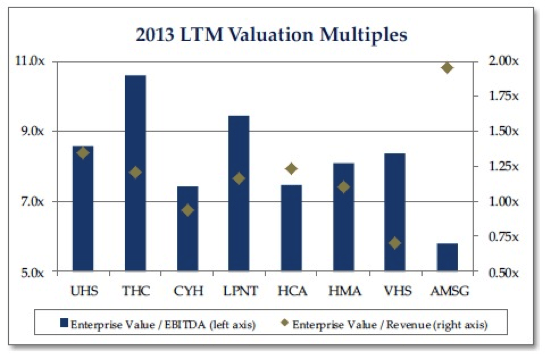 For illustrative purposes, HAI has calculated the enterprise value-to-EBITDA and enterprise value-to-revenue multiples for the publicly traded health systems as well as the only publicly traded ambulatory surgery center company (i.e., AmSurg), and presented these multiples in the table above. Based on this analysis, the median EBITDA multiple was 8.22x while the median revenue multiple was 1.18x. Under the CTM, it is difficult to find transaction data specific to physician-owned hospitals as most relevant transactions are not reported or the data reported is limited in its application to a physician-owned hospital. Additionally, due to the limited amount of publicly available information on physician-owned hospital transactions, additional valuation multiples can be gleaned from small, general, acute-care hospitals, critical care hospitals, and ambulatory surgery centers. Based on a transaction search between 2010 and 2012, HAI identified 37 transactions that appear comparable enough to be used within a CTM. The resulting multiples, which are presented below, represent physician-owned hospitals, critical-access hospitals, and large privately-held hospitals. Based on this analysis, the median EBITDA multiple was 6.86x while the median revenue multiple was 0.82x. HAI also isolated 21 transactions in which the target hospital had physician ownership. Of the 21 transactions, nine reported revenue multiples and six reported EBITDA multiples. Based on this analysis, the median EBITDA multiple was 5.72x while the median revenue multiple was 0.81x. It should be noted that transaction “F,” as presented in the adjacent chart, involved an underperforming hospital with a low level of EBITDA and the transaction was predicated on the value of tangible assets. As such, the resulting EBITDA multiple from transaction “F” is not meaningful or comparable to apply to a well- performing, going-concern, physician-owned hospital. In addition to researching and utilizing hospital transactions in valuing physician-owned hospitals, we rely on HealthCare Appraisers’ annual ASC Valuation Survey as additional market guidance for valuation multiples. Within the 2013 ASC Valuation Survey, HAI polled transaction activity from 17 respondents who represent over 500 surgery centers. Based on this research, HAI observed the following distribution of EBITDA multiples for multi-specialty and single-specialty ASCs. In conjunction with the Income and Market Approaches, HAI often uses benchmarking data, such as the Medicare Comparable Hospital Cost Report and Physician Hospitals of America Quarterly Benchmarking reports, to help evaluate the risk profile of a subject physician-owned hospital. Although the available relevant benchmarking data is limited to select financial and operational metrics, it can be very telling in terms of the operational efficiency and comparable profitability between physician-owned hospitals. Benchmarking can also help ascertain the potential impact of implementing one of the previous strategies mentioned in this article. As illustrated throughout this article, there are many avenues that physician-owned hospitals can take to increase the efficiency and profitability of their operations. Ceteris paribus, these increased efficiencies, combined with greater profitability, will translate into an enhanced value for a physician-owned hospital. 1 According to Physician Hospitals of America, there have been approximately 30 transactions over the past 18 months which have led to the number of physician-owned hospitals across the country to decrease to 240. 2 The term “procedure rooms” includes rooms in which catheterizations, angiographies, angiograms, and endoscopies are performed. “Procedure rooms” do not include emergency rooms or departments. 3 Howard Frederick Hahn and Torri A. Criger, “Health Care Reform’s Impact on Physician-Owned Hospitals,” Journal of Health Care Compliance, September – October 2010. 5 As of the date of this article, Congress is currently considering Expanding Patients’ Access to Quality Care Act of 2013, a bill with bipartisan support. The bill would allow existing physician-owned hospitals to add beds, operating rooms, and procedure rooms; allow existing hospitals or hospital projects that did not receive their license to treat Medicare patients by the December 31, 2010 deadline to move forward with physician- ownership, and reinstate the previous ability of physicians to restore financial viability to distressed hospitals by allowing them to personally invest in such hospitals. 6 Under Section 6001 of PPACA, the aggregate ownership interests of physicians cannot increase. Thus, any further physician syndication must be through the dilution of current physician owners. 7 Free cash flow is defined as the cash flows available to pay-out to investors after funding the operations of the business and after making any necessary capital investments in the business. This article was initially released in the Aug. 21, 2013 edition of the Physician Hospitals of America newsletter, The PHA E-Pulse.